I have decided to do part two of the troughs this week : this is landscaping them. The first thing I always state when taking workshops on landscaping your trough is to make it look interesting before you put any plants into it and then it will look good with plants as well. 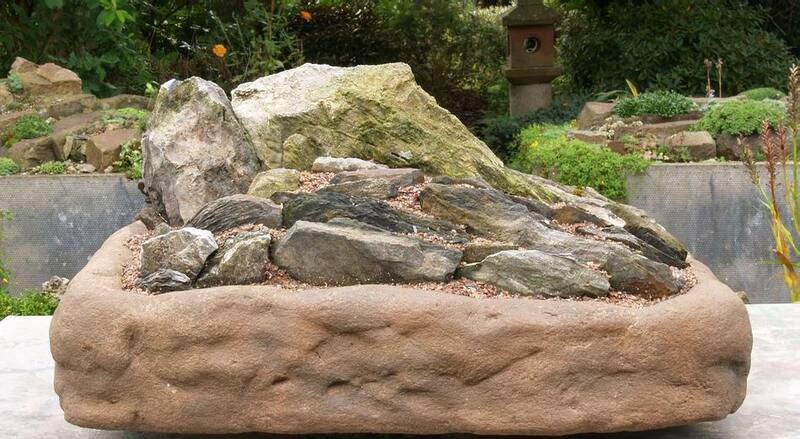 You can see from this trough that I like to achieve some degree of height with my rock work. How often have you heard people say that they wish their garden was not flat - well when you are creating your trough landscape you are in charge. I hate to see a trough not filled to the rim and left flat because inevitably the compost will sink. You end up with a sunken garden so even after top dressing with gravel you end up with several centimetres of the inside edge showing. I will start by showing you two troughs I landscaped at a recent workshop to demonstrate some of my methods of creating both an interesting landscape and also to provide a good planting depth in what was originally a shallow trough. Another bit of advice I always give is to be bold and start with at least one large rock. 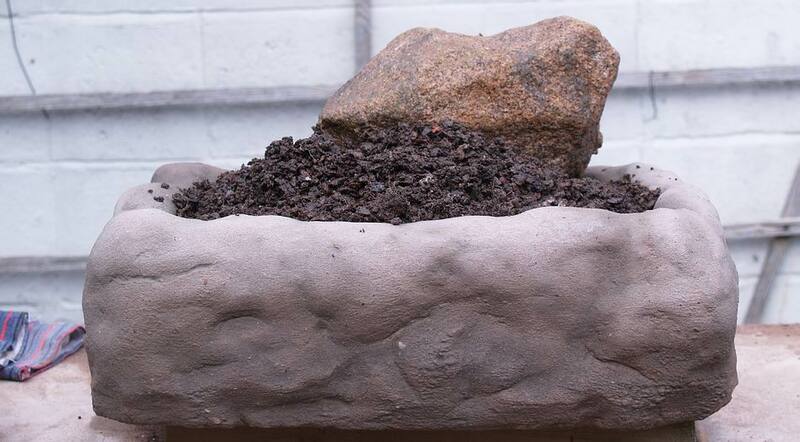 In this case the rock is quite tall so I do not need to make a pile of compost I just fill the trough to a bit below the edge and bed the rock in. If I were using smaller rocks I would make a pile of compost as you will see below. 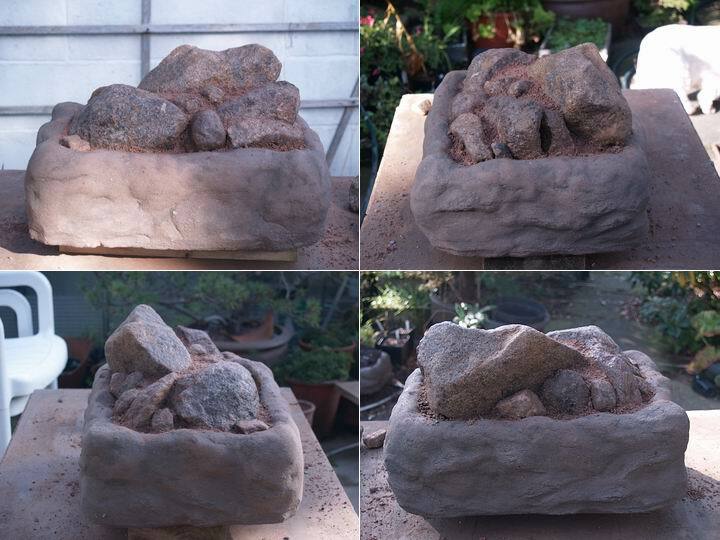 The landscape that you create will depend on the type and shape of the stone you have available and in this case after placing my largest rock I now start to make a series of crevices leading up to a face. Continue to build up the height using the stones and at this stage I would now start to add more compost so it can get well worked in between the stones. The compost I favour for these crevice type plantings is two parts grit one part leaf mould and two parts loam in the base and then as I create the extra height I use a very gritty sand just mixed with a small amount of bone meal to add some nutrient. When I build these up at home I wash the sand down the cracks with water as I go but this was not possible at the workshop. 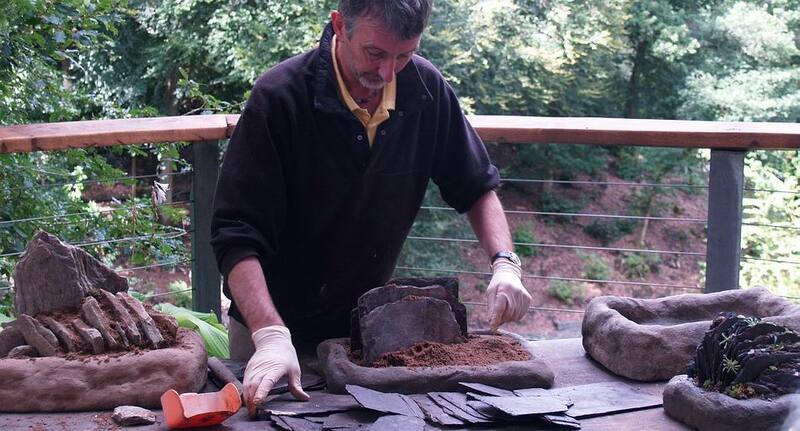 Now switching to an even shallower trough I am going to use old roofing slates to create my landscape and height - here I am just using sharp sand and bone meal. 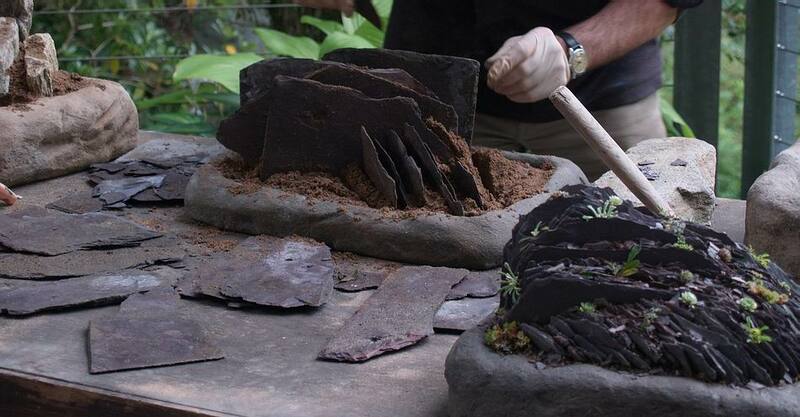 Having filled the trough with the sand I begin by standing some of the bigger bits of slate at an angle across the trough, leaving gaps of about one centimetre between them. Then I set some smaller pieces at an angle to these to help support them adding more sand as I go. Continue working around your trough adding more slate and washing sand in as you go until you are pleased with the effect. When you are watering the sand in watch how the water flows and, if it is running off too quickly in parts, add some extra small bits of slate to prevent this. Once I am happy with the landscape I can add some plants. The plants I use are always very small to start with perhaps just cuttings which depending on the time of year can root very quickly into the sand in the crevices. 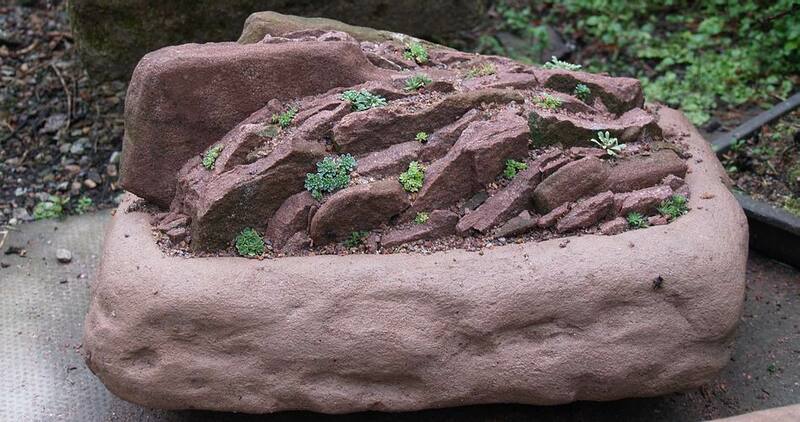 It is not necessary to have masses of stone to landscape smaller troughs like these and this one lump of sandstone when broken up with a hammer and chisel produces enough to landscape at least two or three troughs. 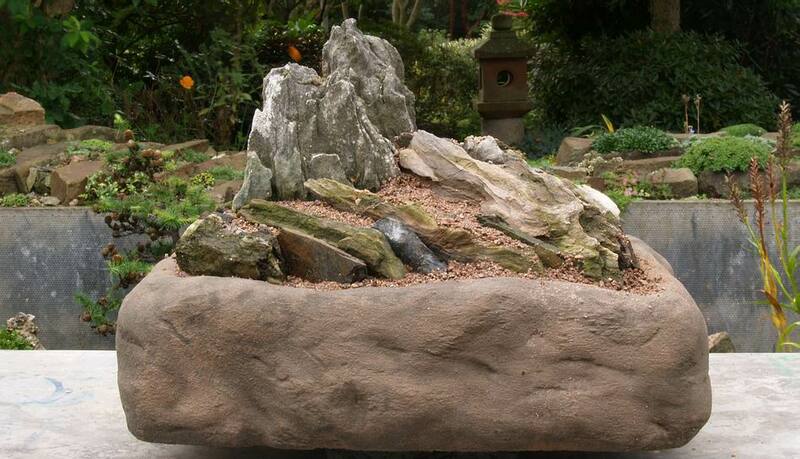 Even if you can just get small boulder shaped rocks you can still create very nice landscapes - in fact it is a good idea if you have a number of troughs not to landscape them all in the same way. 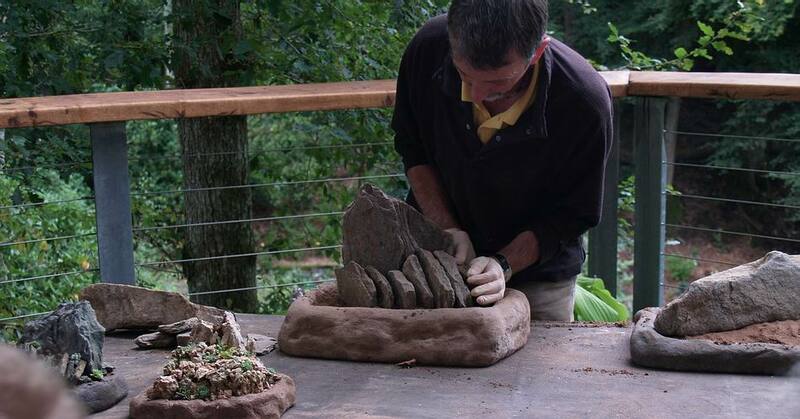 When I use rounded stones I like to make a big pile of the loam based mixture in the trough and place my biggest stone on it. Another consideration when landscaping your trough is how it will be placed. If it is going to be against a wall then the back will not be seen so you take this into account when placing your first stones. If it is to be viewed from all sides then you need to make sure that there is all around interest with planting spaces. As you can see the trough above has a definite front but it is landscaped to look good from all sides. Here is another example of a landscaped trough ready to be planted with New Zealand alpine plants - I like to theme my troughs. 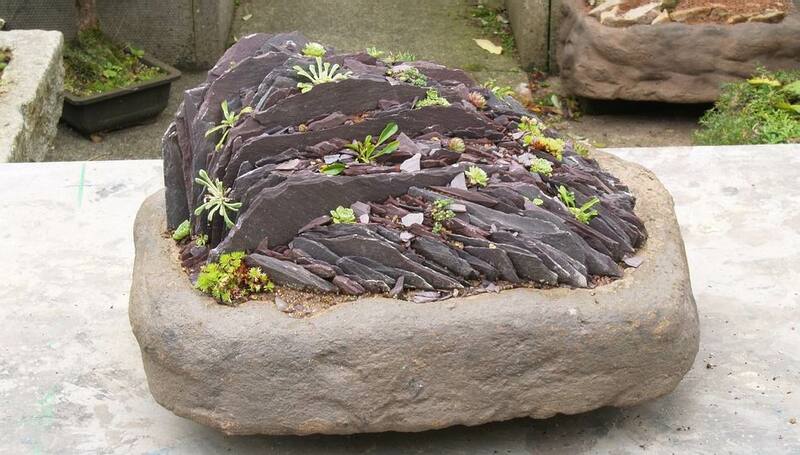 This is a real stone trough which I made from an old granite paving slab. It has only a shallow cavity but I have provided the plants with extra depth by building up with the rocks. This one has been replanted several times over the last fifteen years or so but always with sedums and sempervivums which are stuck in as cuttings. 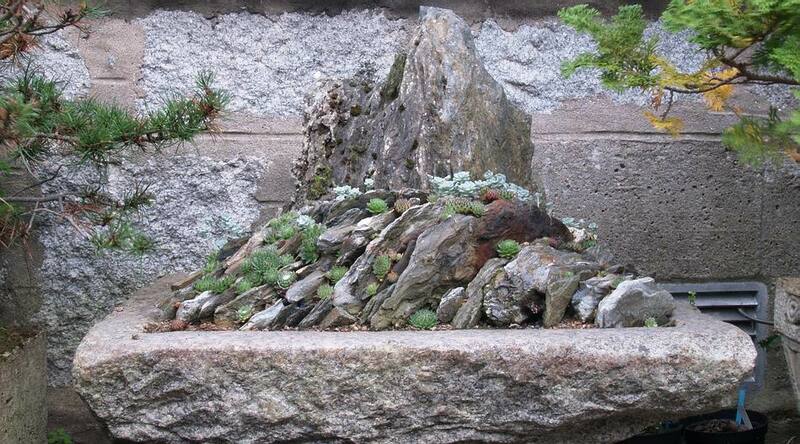 Another trough landscaped with red sandstone and planted with saxifrage cuttings about a month ago. All the cuttings have rooted and are now showing signs of growth. I will add additional pictures of our troughs to the forum in the coming weeks and I will cover more about planting them up now they are landscaped in a future bulb log but now it seems appropriate to review a new book on saxifrage that I have just received. Sometimes when you hold an object it just feels good and you may think this is a strange thing to say about a book but that is exactly how I felt when I first picked up Malcolm McGregor 's book 'Saxifrages'. The cover picture, the layout of the text, the matt finish to the paper and, when you pick it up the solid weight of this book, all make it a pleasure to handle. It is one thing looking and feeling good but what of the contents? On the first flick through I was impressed with the large number of quality illustrations and again the design and layout throughout the book matched the high expectation I had from the front cover. 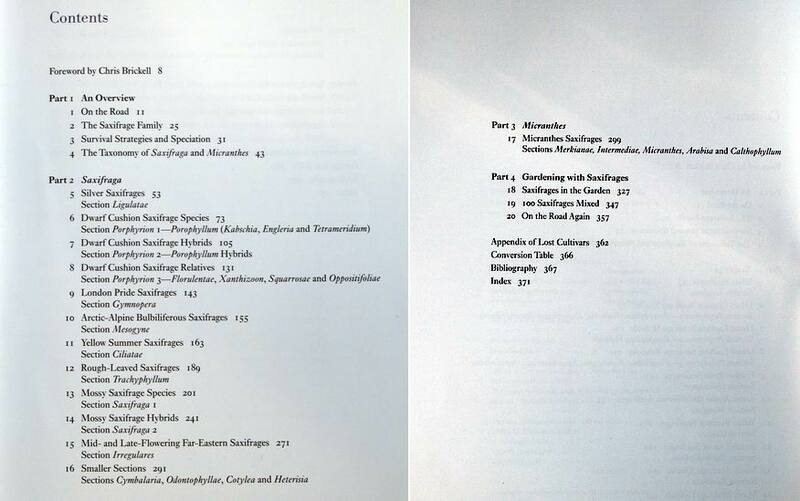 The list of subjects on the contents pages shows just how comprehensive a survey this is with chapters covering every aspect of saxifrages you might want to know, from the ecology, the habitats through the description and taxonomy of the species to how best to grow them in your garden. 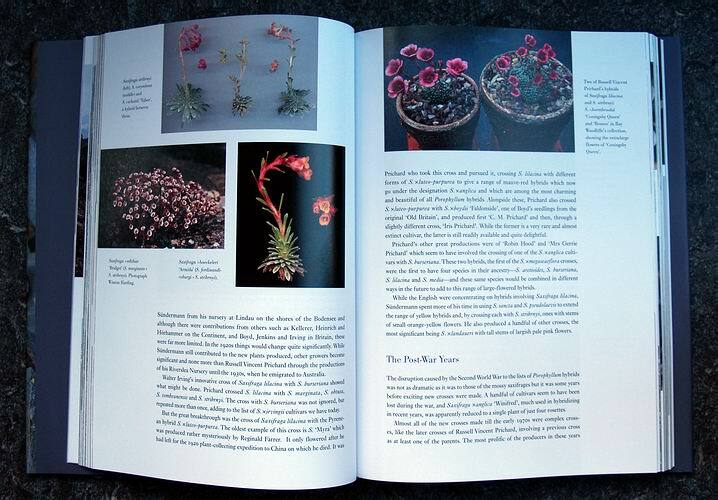 The author opens the book with an account of his early introduction to saxifrages taking us through his increasing interest in the genus as he travelled around the world to view them in their native habitat. I could not help being infected with some of his enthusiasm and like a good meal I finished this chapter wishing for more. 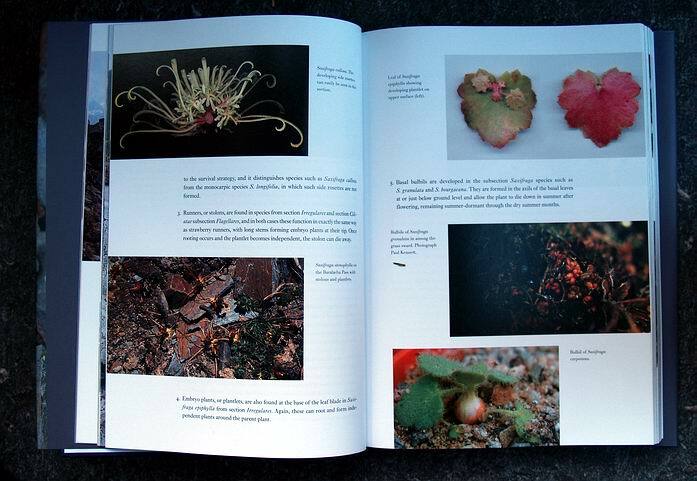 The next chapters give us a detailed over view of the Saxifrage Family explaining survival strategies, speciation and taxonomy in a very readable and understandable way. The bulk of the book works its way through all the different sections describing and illustrating them extremely well. There are very detailed sections on the most popular cushion forming Porphyrion section which includes an exhaustive history of their popularity with alpine enthusiasts through the ages. The very useful and informative listing of hybrids old and new gives the parentage where known. 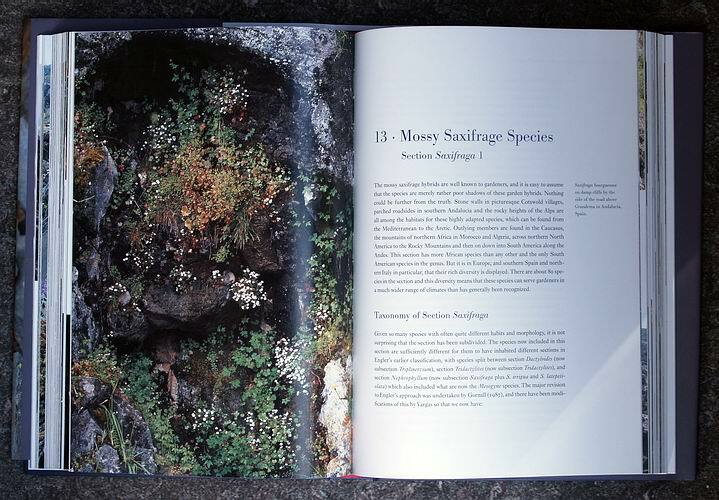 I remember being very taken with the Mossy Saxifrages that I saw growing in Tromso Botanic Garden so I was especially interested to read the section dealing with them and to see just how many species and cultivars there are. 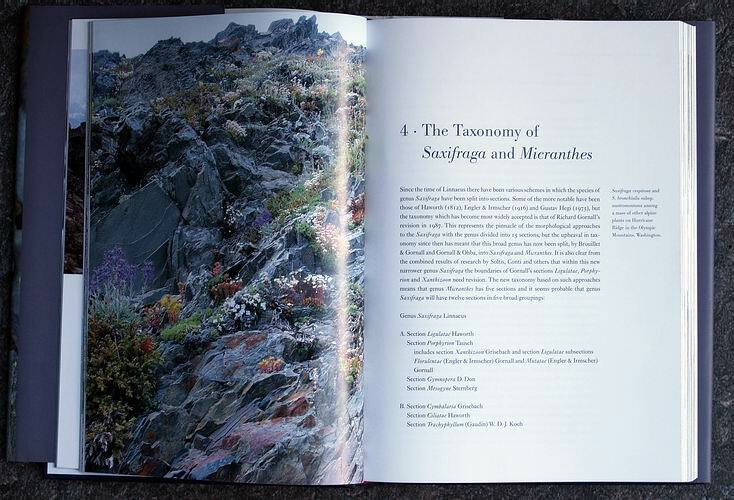 The picture of Saxifraga bourgaena growing by a road in Andalucia along with some of the other beautiful full page pictures of nature's rock gardens are in my view worth the cover cost of the book. I like the layout and design of this book. The lack of margins means that there is more space for the extensive number of pictures many of which have been carefully staged illustrating details or differences between the related plants. 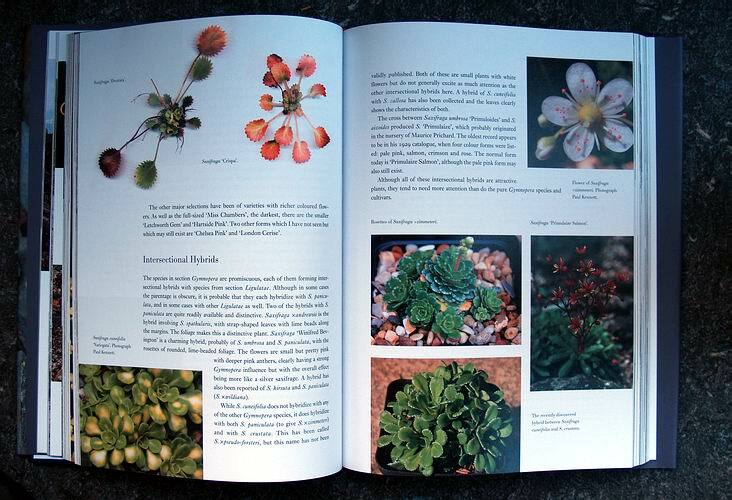 Towards the end is the section giving valuable advice on how to grow saxifrages in your own garden and just to help you further the author recommends 100 of the best garden saxifrages drawn from all the sections that should do well in most gardens. The final chapter 'On The Road Again' sees the author on one of his most recent trips to Morocco and completes the cycle linking nicely back to the opening travelogues and if I am not mistaken the headings of these chapters have a musical connection to the late sixties - very appropriate for Morocco. The only tiny criticism I could make is that when I was checking the accuracy of the index, which was good, I was annoyed to find that the page numbers are not on every page and at one point I had to turn 4 pages over to find out what page I was at. 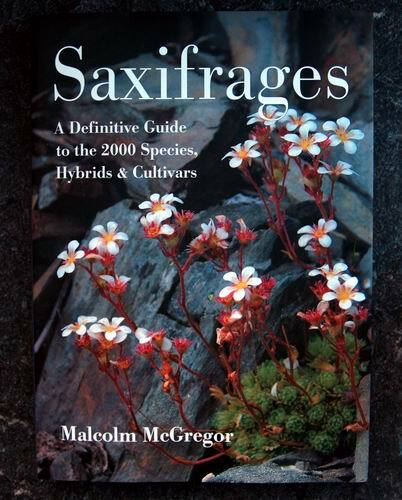 I have no doubt that this will be the definitive book to have on Saxifrages; I cannot see why you would need another. If you are an expert it will serve you well as a reference book. If like me you have had a passing interest in these fascinating plants then prepare to be drawn in by the author's enthusiasm and the beauty of the plants - I seem to have just acquired about 20 new ones as well as having a wants list. If you just want a good book then unusually for this type of monograph it is very readable with all the references to the history, the geography and the people behind the plants. Published by Timber Press and priced at £35 this book is available from the SRGC and many other sources.